The new Olympic Store in Vancouver was designed by Eventscape, a globally known design team, utilizing a vast range of materials and manufacturing techniques. The centrepiece of the shop is a 21m long by 4.5m high curved wall with three polished steel archways that suggest the three Olympic medal standings. The S-curved walls, which hold stunning graphic images of winter sports, make a dynamic backdrop for official Olympic clothing and accessories. Multiple materials were chosen to make the massive structure strong yet lightweight enough to achieve the designers’ intention of having the wall suspended in a way that makes it appear as if floating. The idea of re-usability, along with lightweight, knockdown components, is in line with the goal of making the project highly efficient and ecologically responsible. The designer’s mix of materials continues in the custom millwork base that incorporates glass, colored acrylic and concealed lighting that lights up the merchandise hanging above. 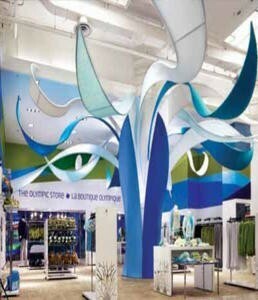 A dramatic “Torch Tree” that spans 21m across the retail floor has a 4.5m high PVC-clad column/trunk (for easy cleaning and durability) with fabric-framed branches. Another featured element includes changing rooms that take the form of pods with sliding doors that display “occupied” in seven languages when closed.